Spontaneous colour preferences have been extensively studied in flower-visiting insects and such preferences exhibited by inexperienced flower-visiting insects are proposed to be adaptive by guiding them to the most rewarding flowers. Thus, spontaneous preferences are hypothesised to reflect the floral reward properties of the habitats in which these insects evolved. However, little is known about colour preferences in non-flower-visiting insects, and the ecological significance of such preferences. We investigated spontaneous colour preferences in the context of feeding and colour learning in the obligate fruit-feeding satyrine butterfly Mycalesis mineus. We report that M. mineus has true colour vision and naive butterflies, both males and females, did not prefer any colour in the absence of olfactory cues in a four-colour test array. 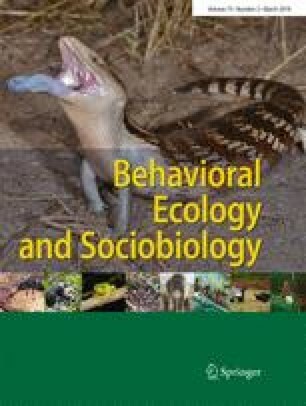 Interestingly, females preferred yellow in the presence of food odour, indicating the modulatory effect of olfactory cues on spontaneous colour preferences. Further, when yellow was replaced with orange, female preference shifted to red, demonstrating the influence of colour combinations used in the test. We also report that M. mineus females rapidly learn to associate colour, both the preferred yellow and the non-preferred blue, with fermented banana as reward. Thus, for the first time, we report spontaneous colour preferences and colour learning in a non-flower-visiting butterfly. We also demonstrate that the colour preferences are sexually dimorphic in M. mineus and argue that multimodal stimuli are important for foraging decisions in fruit-feeding butterflies. Spontaneous colour preferences exhibited by naive flower-visiting insects are thought to reflect sensory biases and are hypothesised to be adaptive as they guide insects to rewarding flowers. However, such colour preferences in non-flower-visiting insects and their adaptive significance remain unclear. We demonstrate that Mycalesis mineus, a fruit-feeding butterfly, has true colour vision and exhibits spontaneous colour preferences and these preferences are sexually dimorphic. We also demonstrate that colour preferences are modulated by olfactory cues and are influenced by colour combinations presented in tests. We also report that female butterflies rapidly learn to associate colour with rewards. Our results demonstrate that naive fruit-feeding butterflies rely on both visual and olfactory modalities and depend on spontaneous and learnt behaviours while making foraging decisions. The online version of this article ( https://doi.org/10.1007/s00265-019-2648-1) contains supplementary material, which is available to authorized users. BGS was supported by a grant (Project A3: DBT/PR12720/COE/34/21/2015) from the Department of Biotechnology. We also acknowledge Harshad Vijay Mayekar for his advice and help provided in rearing and maintaining the butterflies. The work was funded by intra-mural grants from IISER Thiruvananthapuram and the INSPIRE Faculty Award to UK (DST/INSPIRE/04/2013/000476) from the Department of Science and Technology.